Capitol Theatre Gift Cards are redeemable for tickets to live shows and Opera by contacting the Box Office either by phone or in person. 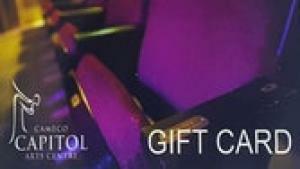 Capitol Theatre Gift Cards do not have an expiration date. Online Gift Card purchases will be mailed via Canada Post to the address on file. © 2019 ShowClix on behalf of Capitol Theatre Heritage Foundation.